On August 10, 1996, the raging Smith Rock fire wiped out most vegetation for one-third of its 600 acres. It was a hot summer afternoon, 100° and breezy, not unlike the conditions we've had lately. 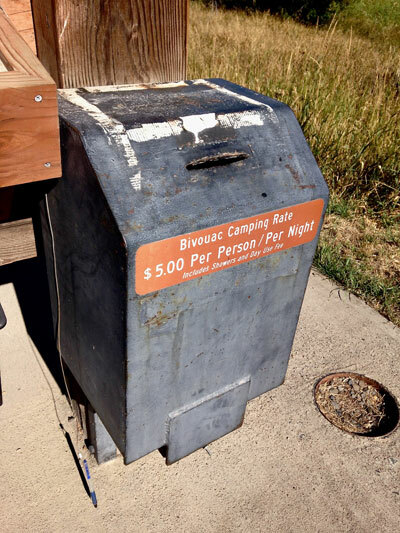 What seems unfathomable is that these are the conditions in which one park employee chose to make welding repairs to a metal fee box in the campground area. Sparks lit up the grassy area below and quickly spread to the neighboring field. We shot scenes of the immense devastation on the day after. It has never been shown before, resurrected from the archives, long before high definition video. 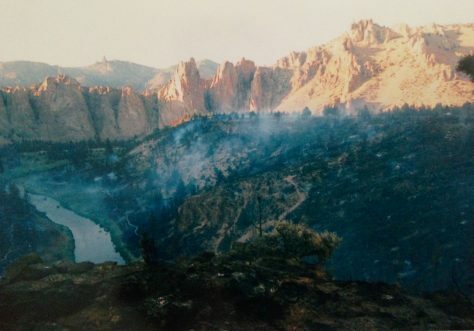 Twenty years later evidence of the Smith Rock fire shows its destructive path. 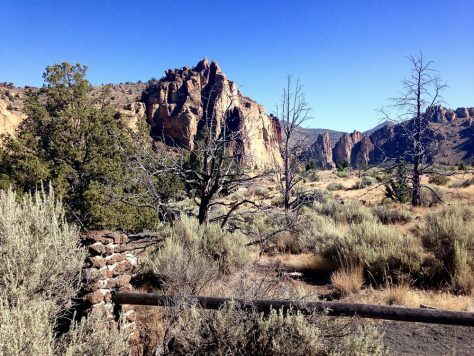 Starting at the field across from the Bivouac camping fee station, go to the Rim Rock Trail. 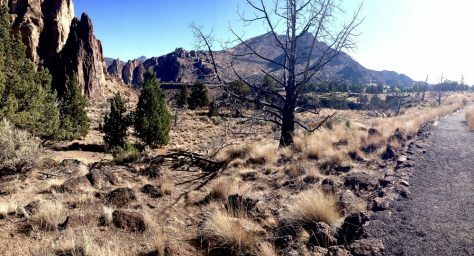 Each tree along the right-hand side shows where the wind took the fire away from the canyon at this point. 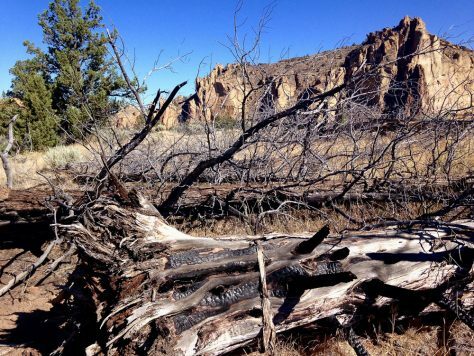 Staying along the Rim Rock Trail follow the dead trees to the point where they descended into the canyon. All trees and vegetation on both sides of the river below the Misery Ridge Trail and along the Homestead Trail erupted into flames. Neighbors were stunned by the noise and roar of the fire. Continuing along the Rim Rock Trail past the Overlook area that goes down into the park you can still see sticks where trees once were. As you walk toward the Turnaround Fee station at the Northern Point you see a massive clump of trees where the wind took the fire up and out of the canyon. It then crossed the road to the surrounding neighborhood. Confusion ensued between fire departments, jurisdictions, the need for a water tanker truck, a retardant bomber, and more. Eventually, a bomber did the job, but not in time for this house. The fire caused the evacuation of many, the loss of one home, and the torching of many acres of 100+ year-old junipers outside of the park. Some say it could have been stopped after crossing the road with a small water hose, but the loss of power to the pumps for wells prevented that from happening. Today, the dead trees and a small memorial to "The Big Flame" at the Turnaround parking lot at the Northern Point are the only reminders of the devastation. 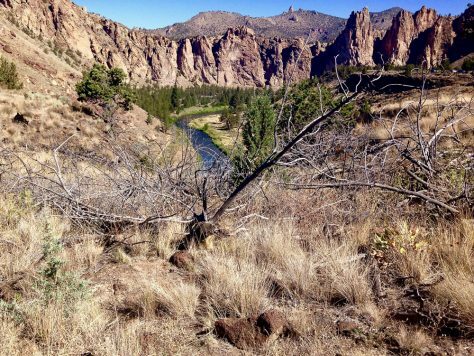 Two years after the Smith Rock fire, Oregon Field Guide produced a video on the restoration efforts that have helped bring the park back to its present glory. The smaller trees are the ones that have come up on their own in the 20 years since the fire. The park has since replaced the fee boxes with solar powered plastic processing stations and has strict rules around smoking and campfires. And welding? Never in August or improper conditions.